This stock is present in portfolio of Anil Kumar Goel, Vijay Kedia. 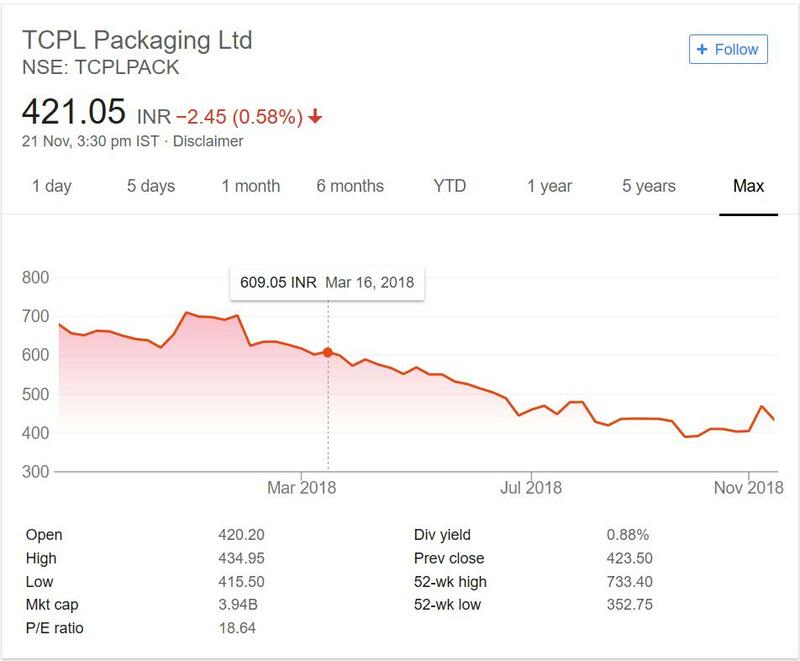 I have written TCPL Packaging stock research report here in year 2019. You should read the latest report. TCPL Packaging is in packaging sector. As per Company website it is one of India’s largest manufacturers of folding cartons, and India’s largest standalone converter of paperboard. TCPL manufactures folding cartons, printed blanks and outers, litho-lamination, plastic cartons, blister packs and shelf-ready packaging. TCPL has also ventured into the flexible packaging industry, with capability to produce printed cork-tipping paper, laminates, sleeves and wrap-around labels. It has manufacturing unit in Silvassa. As per the company website it is the only company which is situated in all four parts of India that is Eastern, Western, Northern and Southern. The company is recently listed on stock exchanges. So there is not much price history is present.Below we will consider the price performance of the Company since IPO days. TCPL Packaging as mentioned above as short life on exchanges. But as per Dow theory all the stock news are digested in price. So we will consider the price performance of Company since IPO days and see if it has performed for investors or not. TCPL packaging made debut on exchange at around 700 mark. It kept on floating between 700 and 600 for quite sometime and then moved past 700 mark.This initial period was golden period for the investors of this company. After March month of year 2018 the prices of company kept on declining. It nosedived from 700 odd levels to below 400 (350) to be precise. There is no recovery or signs of consolidation. The prices declined steadily with time without any resistance and initial IPO investors were left with half of their investment wealth. The dividend yield of the Company is good at current level. Since the company has not been on exchanges for long it is tough to predict if dividend will be regular. So far company has not performed for investors. It is early to say if it will recover or keep on destructing from current levels.It is wise to keep an eye on it. TCPL Packaging is in portfolio of Vijay Kedia. He is one of the top investors in India. Looking at past performance of the Company I will wait for the turn around of the event. It has not performed from IPO days. Judging a company post IPO that too in first few months in not an excellent idea. But the percentage by which Company went down approx 50% is not good signs. It means the performance of TCPL Packaging was not able to meet expectation of investors and initial price of IPO. People has lost money in this counter and there is no signs of recovery. I will not advice to invest in this company. There are many excellent company in Packaging sector which have monopoly and expertise in one of the segment of Packaging sector. Personally I would not catch a falling knife. It is falling every month and there is no signs of price to stabilize. Company has export business also and is one of the major player in its niche. But it would be interesting to see whether it can win trust of investors and make money for them in future. As a investor I am concerned with return only.